Both legislators and citizens play important roles in ensuring a fair and effective state government. 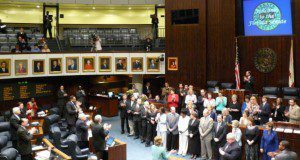 Florida State Representatives and Senators have a responsibility to represent the will of their constituents. Similarly, citizens have a responsibility to educate their Representatives and Senators on how issues may impact them and other local citizens. This three-page guide walks you through the process of making your voice heard and provides some helpful tips to make your message to your legislator stand out. Written by Stacey Ellison and published by the UF/IFAS 4-H Youth Development Department, March 2019. School-based programs provide an opportunity to youth who would not be able to participate in traditional 4-H club offerings otherwise. If you want to expand your 4-H program in diversity, subject matter, and/or number of youth reached, school-based programming may be the solution for you. This 6-page document discusses school-based programs, differences between school-based programming and traditional club programming, reasons to start school-based programs, ways to work with school sites, and enrollment for school-based program youth. It is part of the 4-H 101 Fact Sheet series. Written by Vanessa Spero-Swingle and Susan Munyan, and published by the UF/IFAS 4-H Youth Development Department, April 2018. Eggcellent Adventures in Classroom Embryology is about learning through experience. In most cases, when a teacher signs up to teach chicken embryology in the classroom, the teacher sets up the incubator and the teacher and class wait for the eggs to hatch. That is the experience. But the daily plan of lessons in this guide make the chicken embryology experience an intracurricular experience. 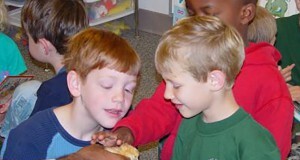 Through a series of activities, students can see firsthand how a chicken develops in an egg. Students will candle eggs to observe chick development, record data, make predictions, and conclude what they think the final outcome will be. The lessons in the guide follow Florida Sunshine State Standards and each contains an experience, instructions, background information, and reflection questions. The 31 lessons address math, language arts, and visual arts in addition to agricultural literacy and science concepts. Written by Shaina Bennett and Judy Levings and published by the 4-H Youth Development Program, October 2015. A visual presentation, either a demonstration or an illustrated talk, is a teaching method in which the presenter shares information with an audience with the assistance of visual aids such as posters, models, and computer presentation software. This 4-page fact sheet covers the method of delivery, the plan, the visuals, how to look sharp and to have a sharp presentation. Written by Stacey Ellison, and published by the UF Department of 4-H Youth Development, June 2015. 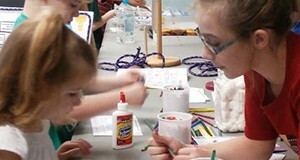 School Enrichment is a partnership between the University of Florida/IFAS Extension Service and a school district to provide educational content in various subject areas. Extension values its relationship with the schools and welcomes the opportunity to provide research-based curricula for classroom use. This 8-page fact sheet includes a desciption of 4-H School Enrichment and its benefits, procedures for starting and scheduling a program, resources and guidelines, and tips for promoting involvement to other 4-H programs. Adapted for use in Florida by Tracy A. Tesdall and published by the UF Department of 4-H Youth Development, April 2015. The Extension Services-237 (ES-237) is a report of the Cooperative Extension Service that consists of enrollment statistics for youth ages 5–18 participating in Extension youth programs and the volunteers providing service to these programs. Since partial funding for Extension youth programs is received through the USDA, each county and state must report each year on the race, gender, grade, and residence of each participant in these programs. 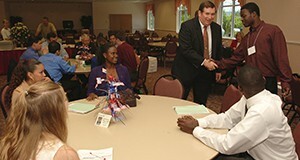 In Florida, the report is completed by each UF/IFAS county Extension office each year using 4HOnline, then submitted to Florida 4-H state headquarters where they are compiled into a single state report and submitted to the National Institute of Food and Agriculture (NIFA) at the United States Department of Agriculture (USDA). This 6-page fact sheet was written by Ben Knowles and Tracy A. Tesdall, and published by the UF Department of 4-H Youth Development, October 2014. The Kids Growing with Plant Connections Youth Workbook (4H194/4H PSM 11) is aimed at educating youth about the basics of horticulture. Youth will be exposed to information on plants and the plant kingdom. Lessons include: What Is a Plant?–Why Are Plants Important?–What Makes Plants Grow?–How to Grow Plants–How to Select and Handle Plants. The Plant Connections Leader’s Guide (4H192/4H PSL 21) is used in conjunction with this youth workbook. This 25-page workbook was written by Janice Easton and Deborah J. Glauer, and published by the UF Department of 4-H Youth Development, January 2015. This 195-page curriculum guide is aimed at educating youth about the basics of horticulture. Youth will be exposed to information on plants and the plant kingdom. Written by Janice Easton and Deborah J. Glauer, and published by the UF Department of 4-H Youth Development, January 2015. Lesson 2: Why Are Plants Important? Lesson 3: What Makes Plants Grow? 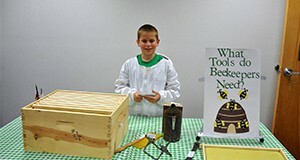 The 4-H Program utilizes many tools or methods to provide educational experiences for youth. The 4-H Council (or other relevant named group) at county, district, and state levels is one of these tools. A Council is an elected representative group of 4-H members who meet, discuss, plan, and assist in carrying out 4-H programs and activities in the interest of the total membership. 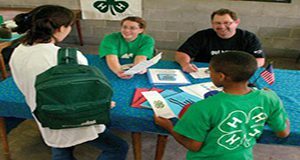 The Council provides a link between local clubs or groups and County 4-H Programs, between County Programs and District 4-H Programs, and between District Programs and State 4-H Programs. This 11-page guide was written by Stacey E. Ellison, Tracy Tesdall, J. A. Rutledge, Joy C. Jordan, and Wendi Armstrong, and published by the UF Department of 4-H Youth Development, December 2014. This curriculum was designed for educators to teach young people about where their food originates by using something children love to eat…PIZZA! According to a recent Gallup poll, kids between the ages of 3 and 11 prefer pizza to all other foods for lunch and dinner. Americans eat about 100 acres of pizza each day, or 350 slices per second!This 4-H in the Classroom project, originating in Pinellas County, Florida, was designed for grades 3–5, but can be adapted to serve other grade levels. The lessons cover subject areas such as mathematics, social studies, language arts, and science. It has been used in Pinellas County very successfully since 2000 by the 4-H Program in collaboration with their Florida Ag in the Classroom Initiative. This 89-page fact sheet was written by Janet Golden, Joy Jordan, Nan Jensen, Betty Lipe, Millie Ferrer, Anne Fugate, Erin Karkheck, Linda Bobroff, Karla Shelnutt, and Tracy Tesdall, and published by the UF Department of 4-H Youth Development, November 2014. The new Florida 4-H Aquatic and Marine Ecosystems: Leader’s Activity Guide helps leaders address the 4-H Science Initiative and is part of the Environmental Sciences Framework, OUR NATURAL WORLD. This framework includes the basic premise that aquatic/marine environments are important in children’s lives, particularly to those children in Florida. The 4-H Aquatic and Marine Ecosystems curriculum provides an opportunity for young people to practice a variety of life skills while learning marine science concepts. The curriculum also utilizes science inquiry as a way for young people (9-14) to gain a deeper curiosity about the natural world. Written by Karen Blyler and Joy Jordan, and published by the UF Department of 4-H Youth Development, November 2014. The Fins and Scales Project is intended for youth age 11-13 (Intermediate 4-Hers). The Leaders Guide follows the layout of the Youth Project Book and provides a suggested approach for each section. Each section of the Leaders Guide contains: Additional background information, answer key, additional activities, opportunities to review, “dive deeper,” and “think like a scientist.” This 52-page project guide was written by Karen Blyler, and published by the UF Department of 4-H Youth Development, October 2014. In this project youth will learn about fish and their adaptations for living in water. This 48-page Intermediate level (ages 11-13) project book was written by Karen Blyler, and published by the UF Department of 4-H Youth Development, October 2014. Contents: A. What is a fish? B. How do fins help a fish? C. How does body shape help a fish? D. How does body color help a fish? E. Why do fish have different mouths? F. Why do fish have scales? G. How can we determine a fish’s age?